Country Americana | A Specialists Perspective | Skinner Inc. This group of six graduated buckets hammered for $1,300, outperforming the expected $600-800 estimate. 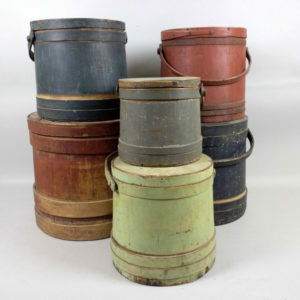 Despite exhibiting a few minor condition issues as a result of age, general wear and use, the pleasing and original painted surfaces on each of these buckets were enough to nearly double the estimate. These would look great in a country setting, either stacked or filled with fresh wildflowers. This group of wooden domestic items, hammered for $1,000, well past its $400-600 estimate. 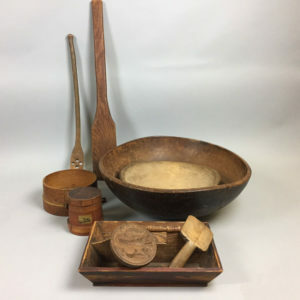 There were a few pieces of particular interest in this lot, including a large blue-painted turned bowl, a miniature firkin, and a butter stamp with an ornately carved eagle, bearing the initials “M.R.” Buyers are looking for strong examples of a form and found that in this grouping. Two Cobalt-decorated Stoneware Crocks, “John Burger/Rochester” and “J. & E. Norton/Bennington, V.T. Cobalt-decorated stoneware is plentiful at auction. These two cobalt-decorated stoneware crocks, hammered for $900 against a $200-300 estimate. While Norton crocks from Massachusetts and Vermont are plentiful in these parts, we don’t see much representation from upstate New York. 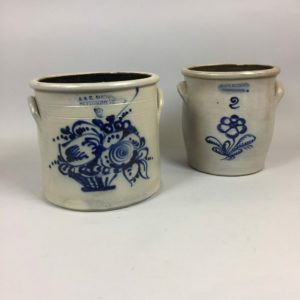 The second crock in the group, the John Burger of Rochester, with a simple and well-centered flower and number “2” has contributed to an upward trend in the stoneware market from this region. Piggybacking on the success seen in stoneware, two broadsides for J. & E. Norton’s “Bennington Stone-Ware Company,” sold for $350. Rarely do we see 19th century ephemera relating to the material we sell. 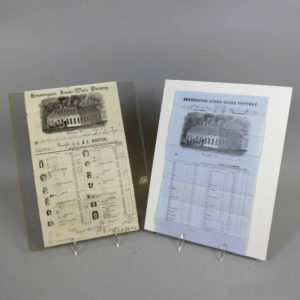 Showing vignettes of the pottery, these price sheets caught the attention of both ephemera and stoneware collectors, as well as historians. 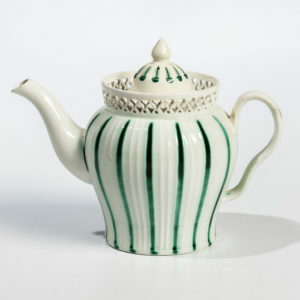 A Leeds creamware teapot with pierced gallery and green striping, hammered at $600, past its $300-400 estimate, despite having a restored lid. One might attribute its success to its 18th century origins, but I think the simplicity and clean design were the main contributors. This entry was posted in Blog and tagged american antiques, Americana, antique wooden furniture, auction results, Broadsides, casual country furniture, country americana, country furniture, creamware, English ceramics, English country houses, firkins, painted antique furniture, stoneware, woodenware by Kyle Johnson. Bookmark the permalink.